Views from the loch. : Wild Trout Competition! Photo 01 - Stevie's opener see "Season Underway" below! 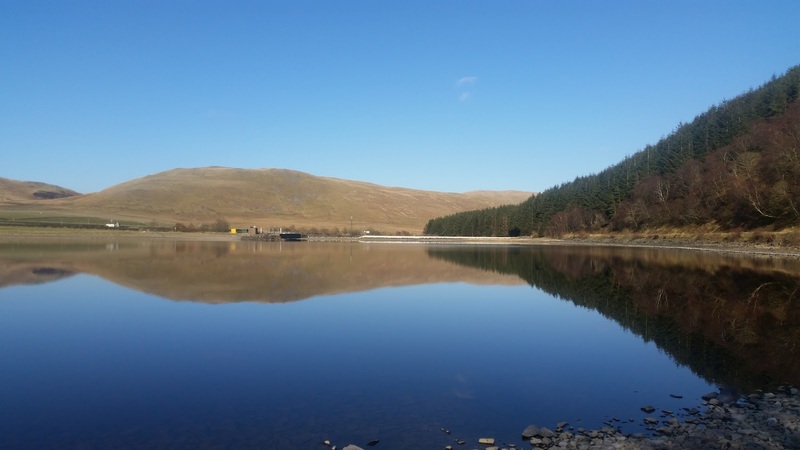 It’s getting close to the time for our wild Trout Competition which this year is being held on the 23rd of April on St Mary’s loch. As per usual the competition will kick off at the Glen Cafe where Hosts Cath and Lisa will provide refreshments and bacon rolls to get our day off to a great start! We are very grateful to them for all that they do for us and believe me, they have helped us out plenty in the past! The competition times are fishing from 10.00 until 16.00hrs with the weigh in shortly after once all the competitors have assembled. At this moment we are unsure if that weigh in will be held at the Tibbie Shiels Inn as in previous years as we are not sure if the venue will be reopening! I will try and find out from Alastair what his intentions are. If we cannot secure the Tibbie then I think we will be very welcome at the Glen Cafe. I think we will be hoping for an increase in water and air temperature before the day to bring on some fly life although today I did see two small fish breaking the surface but not really what you would call a rise. Sunshine as bright as today could be a hindrance so we will be hoping for a degree of cloud cover as well. As always the competition will be open to all excepting anglers barred from the club and it’s always good to see some new faces as well as the well kent ones! Entry fee remains unchanged from that of six years ago when the competition commenced and is a very reasonable £16.00/head. Boats will be made available at no cost for any angler experiencing difficulties with mobility. Fishing method is fly only whereas in previous years it has been any legal method this change has been to create a level playing field. 1st prize a days Salmon fishing on the upper Pavilion beat courtesy of the family of the late Major Sir Neil Westbrook. If the winner is not a member of the club then they will be given a years complimentary membership and will be presented with the Westbrook cup to keep for a year. 2nd prize will depend on the status of the Tibbie Shiels inn we should know the situation next week the prize will also include a years complimentary membership. 3rd prize will be a selection of loch flies chosen by one of our fly fishers and a years complimentary membership. More details and rules for the competition will be published in the coming weeks. Photo 02 Yesterday, you can catch Trout in these conditions! 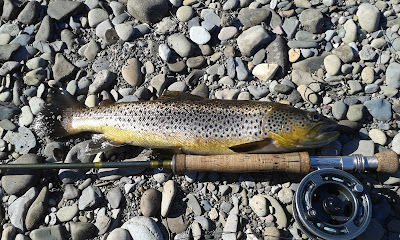 Already the season has moved to day 5 in the all too short Brown Trout calendar and to the best of my knowledge no Brown Trout have been caught. 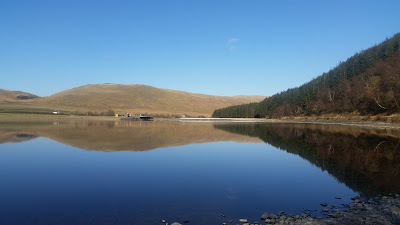 Stevie Nimmo was out yesterday having a bash with the sinking line as the earlier wind of the day had died down and the loch was as flat as a mill pond! Couple that with bright sunshine and the choice of a sinking line is the obvious one! In the heat of the afternoon sun a queen Bumble Bee came about me no doubt looking for food and a mouse hole in which to set up a nest, a great sign that spring is here! Stevie, like a real trooper persevered in what were inhospitable conditions for fishing covering the graveyard and Megget bay areas and it was here in the bay that fortune would smile on him. Yes out of the blue the line went tight and a fish was on. A hectic battle ensued and eventually Stevie got the upper hand, a fine specimen Brown Trout tipping the scales at one pound and eleven ounces with a golden yellow belly! Taken on a small black spider with a gold head on a sinking line a poor day was transformed into a great one – well done that man! 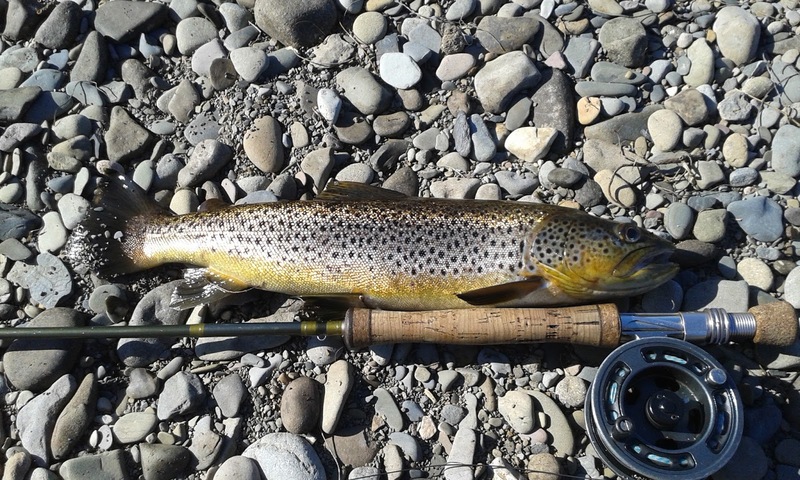 It’s a fine specimen, the first Brown Trout of 2016 and it puts up a high bar for the seasons heavy trout competition! The boathouse is a valuable resource for the club, we can store our boats inside, carry out repairs under cover and also it can provide overnight accommodation for anglers should they desire. An increasing difficulty for the club is however the cost of these keys at roughly £5.00 per key which we have to bear. I think it is reasonable for those anglers looking for boathouse usage to pay the £5.00 on top of their membership and those anglers seeking replacement keys to be asked to pay the said fee as well. I will be putting this point to the committee to get their views and hopefully soon we will have a more sensible policy in the not too distant future. All anglers using the boathouse should be aware that they do so at their own risk and that the club will not be held responsible for any damage or loss to anglers or their equipment! It took him close on an hour to try and camouflage the toxic words of taking from the poor to give to the rich! Yes Minister without a clue Gideon Osborne tried his hardest to try and convince any who were listening that his economic long term plan has collapsed and he needs to raise more money! Fair enough you may say, but remember Gideon Osborne has not met a single economic target in his chancellorship stumbling from one failed projection to the next! His speech on Wednesday was a memorable one in that there was no attempt to disguise the fact that he was intent on further penalising the poor to raise money to compensate for the tax cuts given to the rich! Showing their true colours Osborne and his cronies live up to the tried and tested Tory ideology of bringing back a Victorian society with a hugely widened rich/poor gap! Its almost beyond belief but the minister without a clue wants to rob the very weakest in our society and give the spoils to the already wealthy! It really makes you wonder how people could be so callous and unthinking, of course its always been the Tory way! Here we have a so called chancellor who seems to excel at failing in all that he does and is currently preparing the ground for another financial crash which will of course be nothing to do with the idiotic policies implemented by him! As I write a rebellion of Tory wets is in progress who are aghast at the brutal policy of the fool and it is likely that the policy will be dropped but not before the country sees the Tory party for what it really is! Even benefits axe man Iain Duncan Smith has resigned which is no bad thing as he was a proper bampot and one wonders what his motives really are! Don’t be under the illusion that Duncan Smith is one of the good guys for he is not. Duncan Smith is a fervent zealot with no qualms whatsoever about punishing weak disabled and poor people! He was the architect of punishing policies against poor people! It seems we have a government devoid of compassion, with no direction and little imagination! The only thing they know what to do is hobble the poor to line the pockets of the rich! The ideology of diminishing the state and all the fantastic works that emanate from it eclipses all that they are reducing to poverty millions of vulnerable people is of no concern to a Tory! This budget was a sick joke introducing nothing new, helping only those who already have too much. It makes me wonder just what it will take to make the people of Middle England to realise that this government has no moral conscience, and is intent on creating a two tier state if indeed it is not already one! You would have to be a person without any moral value to be a Tory, come election time, will you have a conscience?